They say never to judge a book by its cover, and indeed there’s many a fantastic pub in the world hidden behind a modest façade. At Fuller’s, we’ve got a few hidden gems of our own - but we’ve also got those special pubs and hotels that catch the eye and steal the heart right from the off. Old, characterful city pubs to country pubs too, full of chocolate-box charm – and centuries-old coaching inns, beautifully restored to their former glories. Situated in the heart of Shakespeare’s Stratford-upon-Avon, The White Swan is more than a midsummer night’s dream – it’s a picture-perfect pub and hotel that draws in visitors all year round. The Grade II listed building greets you with hanging baskets, turreted roofs and Tudor-style timber frames – though at over 550 years old the pub pre-dates even Tudor times. The inside is simply stunning. A £3m restoration project in 2012 saw facilities modernised but heritage retained – with authentic wooden beams, panelled walls and cosy low ceilings in the bar and restaurant, and opulent furnishings including grand mirrors, chandeliers and antique artwork throughout. The hotel’s 41 bedrooms, meanwhile, promise a sumptuous stay. Modern comfort meets vintage style in every room, with some featuring Victorian-style roll-top baths, ornate fireplaces and four-poster beds. Built in 1750, The Churchill Arms in Kensington stakes a genuine claim for the title of London’s most famous pub. It was once frequented by Winston Churchill's grandparents, but is now best known for the incredible array of beautiful flowers and hanging baskets that tumble out onto the street from its frontages. Recognisable from several blocks away, it’s an unmissable pub in every sense. The character continues inside, where history and heritage literally line the walls. There’s Winston Churchill memorabilia here in abundance, alongside a fascinating collection of other trinkets and nicknacks from times gone by. Head to the back of the pub and you’ll find one final serving of history, too. The Churchill Arms was the first pub in London to serve Thai cuisine, and it remains home to a fantastic Thai restaurant today. The Red Lion in Hillingdon is a 16th century hotel steeped in history at every turn. Its real claim to fame dates back to 1646 - when King Charles I checked in, disguised as a servant, as he fled the Siege of Oxford during the English Civil War. In the bar there’s an account of the fugitive King’s flight, and that’s just one of many reasons to pay a visit to this special, historic hotel. The bar areas are resplendent with olde worlde charm – all rich oak panelling, feature fireplaces and cosy corners. And the bedrooms are sumptuously furnished, some with wooden beams and grand four-poster beds. The Red Lion even has part of the great wall of London visible in the car park – hinting at the historic experience to come even before you set foot in the door. Once upon a time, the Lamb & Flag was a regular haunt for Charles Dickens – and it’s a place that could certainly tell many a good story. It was even the scene of bare knuckle fighting in the early 19th century, briefly earning it the nickname ‘The Bucket of Blood’. There’s been a pub on the site since 1772, but despite its proximity to Covent Garden, it’s always remained untainted by the trappings of tourism. The décor is authentic and aged, the wall-hangings centuries old, and the bar well worn, well loved and well leaned on. The pub is small but perfectly formed, with its cosy, narrow entrance leading to a bustling scene at the bar. The outside is full of character too, with a wooden façade dating back to 1958 and, usually, a host of hanging baskets to greet the visitor. Tucked away on a back street, it’s the kind of place you’re unlikely to stumble upon by chance – but it’s somewhere that’s definitely worth hunting out. 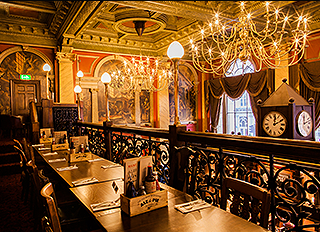 Our most northern pub, The Old Joint Stock in Birmingham, is arguably one of our most characterful buildings too. It’s a Grade II listed building that dates back to 1862, with huge, imposing stone pillars out front hinting at its former status as a financial institution. The pillars are separated by vast, floor-to-ceiling windows, affording diners and drinkers a great view of Birmingham’s St Philip’s Cathedral – but there’s plenty to catch the eye inside, too. Ornately plastered walls, dramatic chandeliers and a magnificent glass-domed ceiling make this an authentic throwback to the Victorian era. And if that’s not enough to make The Old Joint Stock a truly unique pub, then the addition of a 105-seater theatre in 2006 certainly tipped the scales. Last but not least in this look at some of Fuller’s most special buildings is The Old Customs House in Portsmouth. As the name suggests, the pub is set in a former customs house which once served as HMS Vernon – a shore establishment for the British Navy. The sense of naval history washes over this place, and it’s that heritage that saw the grand building become Grade I listed. Outside, distinctive red brickwork dominates, while the British flag flies beside the door to welcome visitors aboard. Cross the threshold and you discover a classy, elegant interior too, with parquet floors and a marble-topped bar. A spectacular spot inside and out, The Old Customs House is a waterside wonder well worth discovering.